Thank you for your offering last weekend which totalled £624.23 Attendance was 230. Once again St Margaret Mary SVP will be distributing food parcels for families in need before the start of the school summer holidays. We hope to distribute parcels in the week beginning Monday 13th July. Please leave items in the box at the back of church, having checked 'best before' dates. Thank you once again for your invaluable support. The July talk sees us focusing on the experiences of Christians living in the Middle East and the conditions they are currently experiencing. Dr. Caroline Hull from the North West office of Aid to the Church in Need will be speaking. The evening begins at 7.30 pm on Thursday 2nd July - please try to come along. On Wednesday 1st July at 7.30 pm there will be a meeting in the Presbytery at Christ the King for anyone wishing to help with catechesis in the parish from this September. Please let Fr. Michael know if you are able to come along…help is needed for Marriage Preparation, Confirmation and Baptismal Catechesis. Wednesday 10.00 am - 2.00 pm and Sunday 12.00 - 3.00 pm. For more information contact the centre manager, Trevor Tiffin, on 524295. Please submit your forms as soon as possible. There are still places available on this pilgrimage. 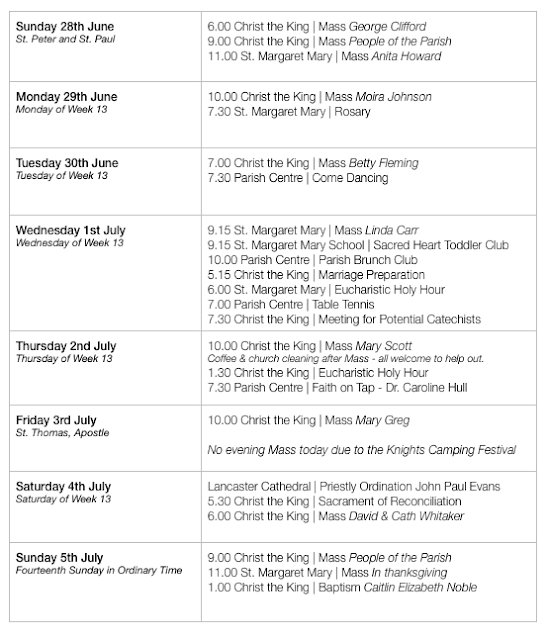 The pilgrimage will take place from Tuesday 17th May 2016 returning home on Monday 23rd May. Price will be £759 including flights based on two people sharing and will be half-board [breakfast and evening meal] in a hotel situated near St. Peter’s Basilica. There will be an optional excursion to Assisi on the Saturday of the pilgrimage. Please send booking forms directly to Tangney Tours before the deadline of 30th June 2015. A festival is being held at High Wray on the shores of Lake Windermere between 3rd and 5th July. £20 a pitch camping, vans, caravans. Limited places so book now to avoid disappointment. Telephone Paul Lovell on 07788 818535. A formation workshop offered by the Office for the New Evangelization for altar servers of all ages. Saturday 18th July in the New Waterton Hall 10.00 am to 4.00 pm. The cost will be met by the parish. Any servers interested in attending, please see Fr. Michael. On Wednesday mornings at St. Margaret Mary School 9.15 am - 11.30 am 50p per child. All parents and carers welcome - children welcome from birth. Refreshments and snack provided and no booking required. Contact Laura for further information on 0755167152 or email: littlemoonbeams@hotmail.co.uk. CAFOD are looking for someone to be a local contact for their work at the church of Christ the King. Anyone interested should contact 01772 733310 or email lancaster@cafod.org.uk. Please pray for John Paul-Evans who [d.v] will be ordained to the Sacred Priesthood on Saturday 4th July at Lancaster Cathedral. Experience the beauty of the Lake District and support our diocesan Youth Service. The Manor is open for bookings from groups, individuals and families, 17–31 July & 2-10 August. B&B just £25 per adult; reduced rates for children and teenagers. For more information, or to book, please contact Gillian, on 017687-72711. On Tuesday 21st July at 7.30 pm at Warwick Bridge. Fr. John Millar will talk about Music in the Church’s Worship. All are welcome to come along to these talks. On Sunday 28th June. All welcome. Setting off at 10.00 am. Join us for Mass at 9.00 am. Afternoon Tea on return. Please let us know you are coming on 017687 72711 or email: team@castleriggmanor.co.uk. 25th to 28th August this year. Cost £200. If you are interested, please contact Jo Muter on 01228 524087. More details to follow next week. This DVD [43 minutes long], which presents the Church’s authentic teaching on marriage and family life, will be screened in the Parish Centre on Sunday 12th July at 7.30 pm. In light of the forthcoming Synod on the Family being held in Rome in the Autumn, it is a worthwhile exercise to come along and watch. Fr. Michael would like help in organising an international lunch for parishioners some time in July - any volunteers to help bring the parish together to celebrate the great international family we are? Thank you for your offering last weekend which totalled £701.31 Attendance was 222. Thank you to all who worked so hard to enable the celebration of our parish feast day. A lot of work goes on behind the scenes, often unnoticed by most parishioners, to enable such a celebration to take place. 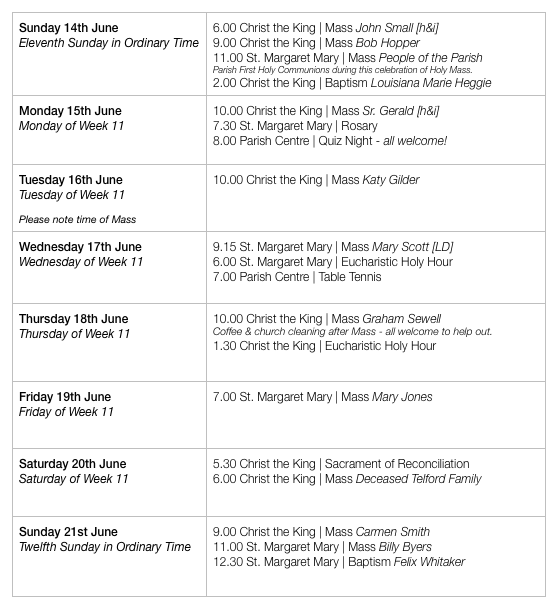 Please note the times of Mass in the parish this week. Please leave items in the box at the back of church, having checked 'best before ' dates. Thank you once again for your invaluable support. Thank you to Ann, Eileen and Catherine who have worked so hard to prepare the children so well for today’s celebration of First Holy Communion. Could God be calling you to build up His kingdom by helping others to be formed in the faith? The parish needs willing and able volunteers to assist in the field of catechesis. We have a strong First Holy Communion team but we’re looking to introduce programmes for Baptism, Confirmation and Marriage from September. Please pray about this as the future of the parish very much depends on individual parishioners being willing to help others to deepen their faith through this essential formation. The Cor et Lumen Christi community, St Cuthbert's The Old Convent, Wigton CA7 9HU, invites you, 19-21 June. Donation only after £10 registration fee. Includes meals. For details at www.coretlumenchristi.org, e-mail: stcuthberts@coretlumenchristi.org, or phone, 016973-45623. Każdemu dziecku które kończy 3 lata w terminie do 31/08/15 przysługuje , od września 2015, do 15 godzin tygodniowo darmowej opieki przedszkolnej. W przedszkolu, St. Margaret Mary Nursery, mamy wolne miejsca od września 2015. Formularz zgłoszeniowy dostępny w sekretariacie szkolnym. 01228 401800. On Wednesday mornings at St. Margaret Mary School 9.15 am - 11.30 am 50p per child. All parents and carers welcome - children welcome from birth. Refreshments and snack provided. No booking required. For more information, call Laura on 07551671522 or email: ittlemoonbeams@hotmail.co.uk. Fr Michael will be in Rome from 16th - 19th June with the Primary Headteachers of the diocese. Fr. Norman Johnson has kindly agreed to celebrate the weekday Masses. CAFOD are looking for someone to be a local contact for their work at the church of Christ the King. Anyone interested should contact 01772 733310 or email: lancaster@cafod.org.uk. Please pray for John Paul-Evans who [d.v] will be ordained to the Sacred Priesthood on Saturday 4th July at Lancaster Cathedral. John Paul deaconed the Mass on Friday evening and is currently completing his training at Oscott College. Masses will be offered in Rome for the intentions of parishioners. Thank you for your offering last weekend which totalled £683.65. Attendance was 257. This Friday - please make an effort to come along to this celebration in the parish. Damian Howard, Lancaster Cathedral organist, will play. Fr. Mark McManus, Dean of Chesterfield, will preach. First Holy Communion will be celebrated next Sunday [14th June] during the 11.00 am Mass. The music groups from both parishes will combine for this celebration so the 9.00 am Mass will be without musical accompaniment next Sunday morning. All parishioners are encourage to attend the 11.00 am Mass. Booking forms are now available for the pilgrimage to Rome. The pilgrimage will take place from Tuesday 17th May 2016 returning home on Monday 23rd May. Price will be £759 including flights, based on two people sharing, and will be half-board [breakfast and evening meal] in a hotel situated near St. Peter’s Basilica. There will be an optional excursion to Assisi on the Saturday of the pilgrimage. Please send booking forms directly to Tangney Tours before the deadline of 30th June 2015. A detailed itinerary will be distributed prior to departure but the pilgrimage will include attending the Papal Audience and Angelus. At Our Lady & St. Joseph’s on Saturday 13th June beginning with Mass celebrated by Bishop Michael Campbell at 12.10 pm followed by a buffet and presentation in The New Waterton Hall, Warwick Square. You are all warmly welcomed to attend. For details please contact, Sr Maureen on 01228 541541. A festival is being held at High Wray on the shores of Lake Windermere between 3rd and 5th July. £20 a pitch camping, vans, caravans. Limited places so book now to avoid disappointment. Contact Paul Lovell on 07788 818535. 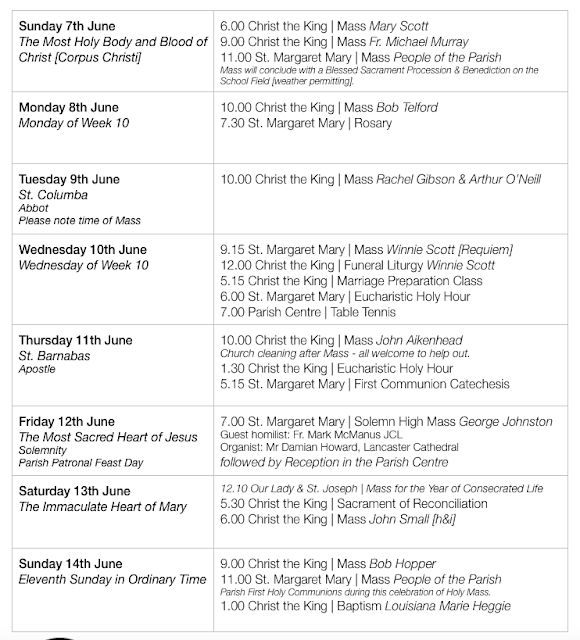 The Cor et Lumen Christi community, St Cuthbert’s, The Old Convent, Wigton CA7 9HU, invites you to the above on 19-21 June. Donation only after £10 registration fee. Includes meals. For details at www.coretlumenchristi.org, e-mail: stcuthberts@coretlumenchristi.org or phone: 016973-45623. A formation workshop offered by the Office for the New Evangelization for altar servers of all ages. Saturday 18th July in the New Waterton Hall 10.00 am to 4.00 pm. The cost will be met by the parish. Any servers interested in attending please see Fr. Michael. Każdemu dziecku które kończy 3 lata w terminie do 31/08/15 przysługuje , od września 2015, do 15 godzin tygodniowo darmowej opieki przedszkolnej. W przedszkolu, St. Margaret Mary Nursery, mamy wolne miejsca od września 2015. Formularz zgłoszeniowy dostępny w sekretariacie szkolnym. Tel - 01228 401800. St Margaret Mary's School will host the parish toddler group as of Wednesday 10th June 2015 9.15 am- 11.30 am. Cost - 50p per child. All parents and carers welcome - children welcome from birth. Refreshments and snack provided. No booking required. For further information, contact Laura: 07551671522, = or email: littlemoonbeams@hotmail.co.uk.